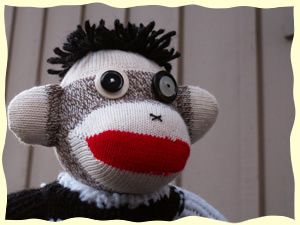 Looking for a do it yourself "Sock Monkey Kit"? Note: If you don’t have a sewing machine, I will be happy to do the machine sewing for you for only five dollars. Note: Note: There are sharp needles and small items...this kit is not for young children. Are you having a hard time finding the Sock Monkey that you really want? Sometimes, if you want something done right, you have to do it yourself. That doesn't mean that you have to do all the work. Sock Monkey Fun can help you Build Your Own Monkey. We offer naked (oh-my!) Monkeys and "do it your-self kits". Find more choices at www.SockMonkey.net! 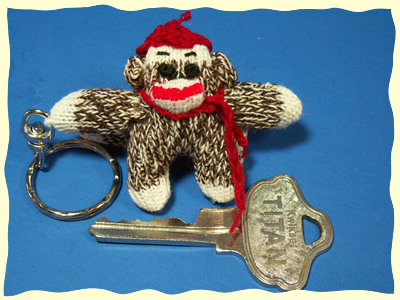 Do you need Sock Monkey that will fit in your pocket or purse? How about a Sock Monkey Pin? Art Bell says that "they"